Simon Says Stamp and Show: Challenge: Paint it up! It is no secret that I adore paint. You can use it on altered projects, with stencils, to alter a patterned paper, and generally customize your project. Water it down a bit and flick it onto your project like mist, use a thick paint for texture, or just use some plain gesso to create a nice surface to start on. However you use it - and whether you're using some dabber paints, crackle paints, or anything in between - we can't wait to see this week as we challenge you to add some paint to your next crafty project and join us. 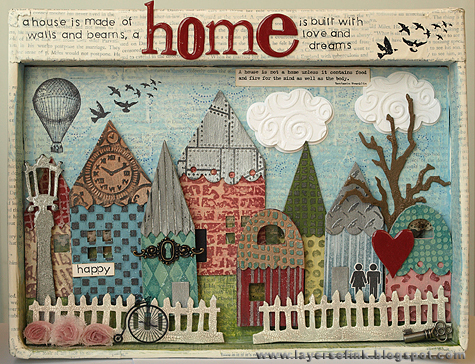 Anna-Karin built a happy little town in a recycled toy packaging box using lots of paint and dry embossing. I love building little scenes and I have wanted to make a dimensional town with the Artful Dwellings die for a long time and this little shadow box formed a perfect setting. The background was covered in book pages and painted. The houses and roofs were die-cut from grungeboard, painted with dabbers, dry embossed with lots of different folders, sanded and inked. Clouds, a tree, a lamp post, happy couple, fence and a little bike finished the scene. A found neglected frame was the inspiration for Tracy Evans' heartfelt home decor piece. I love hearts in my artwork, I love the shape and although it often symbolises love and affection I think it's perfect for so many occasions. I adore the combination of wood and paint, a coat of PaperArtsy Fresco Little Black Dress, followed by the Crackle Glaze and top coat of Snowflake, and a once neglected frame is given a new lease of life. This is going to be a perfect birthday gift for one of my family members. A few weeks ago I learned this amazing dry brush technique at an online workshop. Patience is key to achieve the effect. I'm not a patience kind of girl, so it was a bit of a challenge for me. 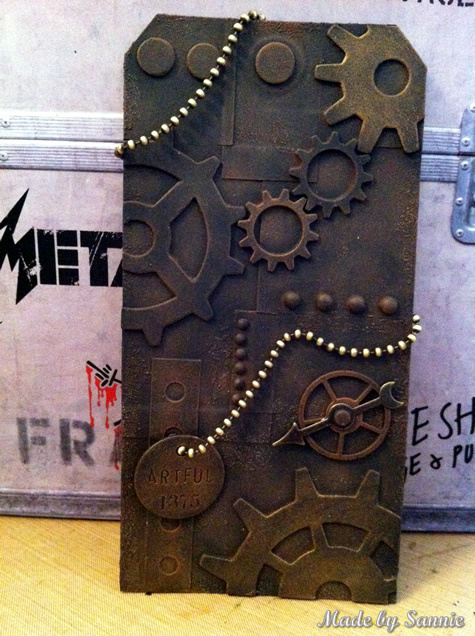 Before I started painting I've created the textured rust effect using Black Soot Distress Embossing Powder, and embellished the tag with some Gears, Ball Chain, Spinner, and some Gadget Gears die cuts. For the base coat I've used Pitch Black and for the effects Terra Cotta, Gold and Espresso. The trick of this technique is to use a tiny bit of paint on the brush. Suzz was painting another project and grabbed a piece of muslin to wipe down her other project. That piece of muslin was the start of my paint it up project! The texture on the muslin allowed for areas to be misted using Tattered Angels Glimmer Mist and Chalkboard Ink. I layered in images from the Artistic Outpost Diesel Punk and 7 Gypsies Number Barcode to create a mixed media project. My middle daughter has just started her driving lessons and this was created with her in mind. 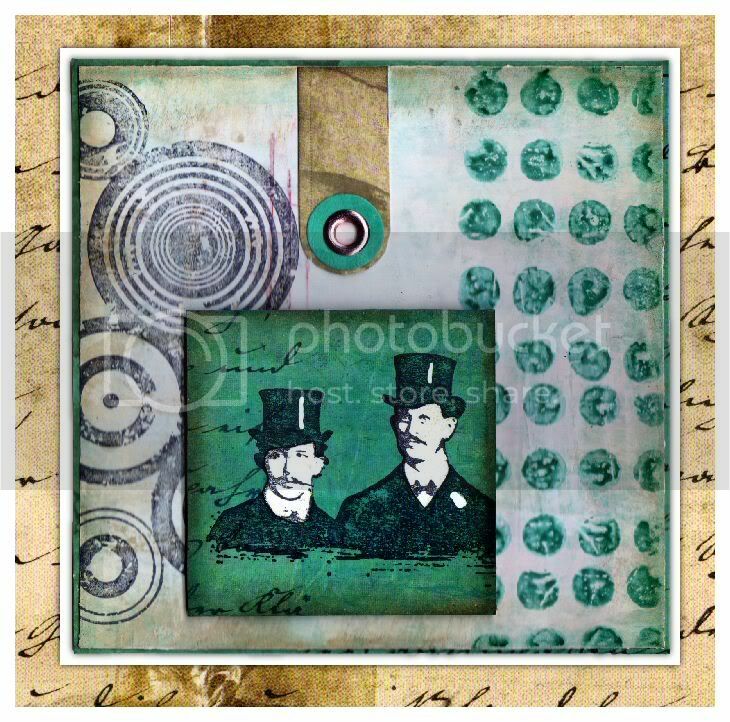 Candy's recent purchase of the Stampers Anonymous Phrenology Stamp and the Paper Artsy Hot Picks 1107 Stamp were her inspiration in creating this canvas. I love experimenting with different techniques using paint. It is so much fun! The Paper Artsy Fresco Finish Acrylic Paints were perfect for brushing, blotting, and stamping the background for my latest fascination; the Phrenology heads. 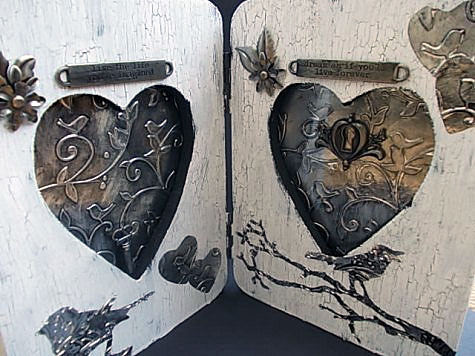 Even Tim Holtz' Ideaology Wings, Mini Gears, Mini Numerals, Time Pieces and Sprocket Gears look like they have an aged patina finish, thanks to a simple finger swipe of paint. Dan wanted to make a bold statement in teal with his grungy card. I had a lot of fun making this - one of my favourite techniques is to apply paint with a Ranger Craft Scraper and that's how I coloured the background and tile on this card. It lets you apply really thin layers of paint with out watering it down and losing the vibrancy of the pigment. I used Claudine's Classic Teal, Traditional Tan and Gesso for the background, some of the Tattered Time paper stack, and Peacock Feathers and Archival Black for the stamping. Terry decided to make a Parisian Tag with lots of Paint and inks on it. I was in the mood for some girlie colors and decided to choose the Spun Sugar, Vintage Photo, Victorian Velvet and for the first time ever Black Soot. What a fabulous color. I have played with Tim Holtz's stampset cause it has the cool Eiffeltower in it, the cute image of the girl fits right in this way. The word stick says everything about holding on to what you have and that you should appreciate it a lot. The one thing that should not be missed is Crackle paint! I played with it on the Eiffel tower the corrugated card and on the girl to give it an extra fragile look. I (May) was in the mood for a little decorating, and my plain Studio Calico book was the perfect subject for me to color with paints. I am a big fan of Ranger dabber paints - they're easy to use, they require no brush, and they can be put to work in so many ways. After I coated my cover in paint I started lightly brushing on other colors of paint, and I did one of my favorite things with lemon drop and chicken feed Jenni Bowlin dabbers - I stamped with them! Some tape, ink, and a little sentiment later and this mini notebook is ready to be filled with ideas galore for the upcoming fall season. Can a painted piece of card stock become a durable book cover? Ashli sure thinks it can! I have a ton of old house paint laying around. In fact, this green used to be the color of my kitchen. Certainly a questionable color for a wall, but used on this little notepad it is quite fun. When painted on in several layers, any latex based paint becomes very flexible and durable. After running my painted card stock through my Sizzix using the DOTS embossing folder, I smooshed around a bit of gesso with my finger. To dress it up a bit, I added some Washi tape and the gorgeous flowers from the Basic Grey Konnichiwa collection. The interior pages were simply sewn inside the cover, making a perfect place to "Jot" down some notes! 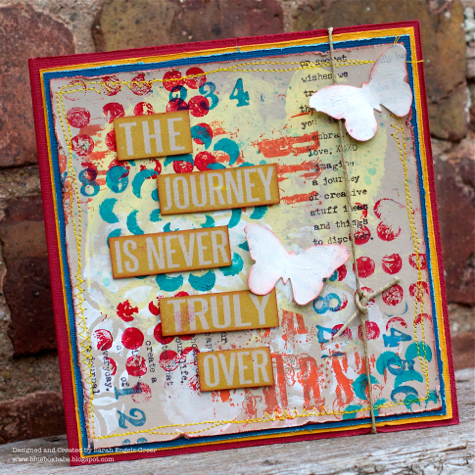 Sarah surrounded herself with lots of her favourite colours, stamps and paints and created two expressive layered cards. When I'm unsure of what to create, I love to surround myself with an array of my best loved crafty goodies. I just start playing and let things happen! 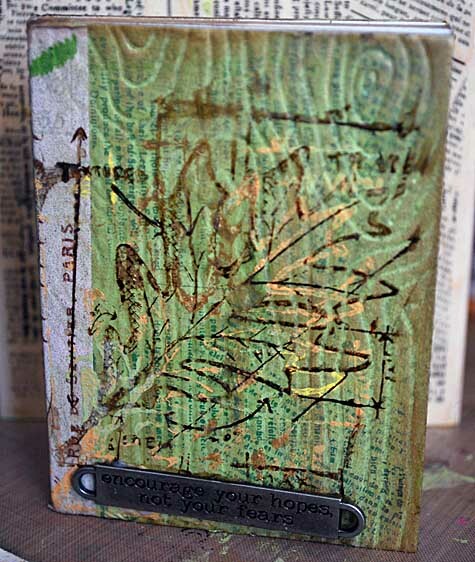 I indulged in a little Art Journal style fun building up the layers of paint and ink using my Tim Holtz Mixed Media stamps, Claudine Hellmuth Studio paints, gesso and die-cut butterflies. Combine all of these great products with a swipe, stamp, stitch and splatter and you end up with a funky grunge creation. With so much possibility from accenting to creating your own patterns, layering to blending to totally altering materials paint is a great staple supply. I encourage you to check out each of the design team member's blogs for more photos, supply lists, and more. Simply click on their name (above the photo of their project) to visit their blog. Now that we've shared their creations - we're ready to see yours! 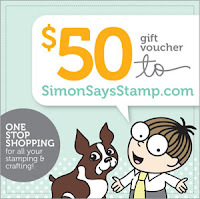 As always, Simon Says Stamp is once again giving away a $50 gift voucher that will go to a random entry chosen by Random Generator. The challenge will close at Midnight Eastern time on Sunday, August 12 and the winner will be announced later the following week. To qualify all you need to do is create a new project that ties in with our theme and post it to your blog, then add a link here. For the full rules, read the "challenge rules" posted in the side-bar here on our blog. We can't wait to see what you make. Wow, amazing DT creations! I hope I have time to play! Thanks for the inspiration! How fabulous is that? I love your creations! These are some amazing paintings..Really loved your art work. Wow! Great DT samples on display! Thanks for the "paint it up" challenge! Thanks! You deliver me from making cards (:o) Lot's of fantastic creations from the DT i've seen and they inspired me. OK...just added my project to this very impressive gallery. Wow! Y'all are oozing with talent! First SSS contest I've ever entered...I'm kind of excited! Another great challenge, with incredibly inspirational DT projects - thank you! Really wonderful artwork projects from the DT members, thanks a lot to all ! And a very open challenge ! so happy to participate again.. thank you. I enjoy your challenges. I want to thank the design team members and participants that take the time to leave comments on my blog. Blessings!